CHE’LU’s mission is to preserve Chamorro culture. Over the years the Chamorro Cultural Festivals have grown through the teaching and showcasing of our culture. Once every four years, the Pacific region gathers to celebrate their arts and culture at FestPac (Festival of Pacific Arts). FestPac will be hosted by Guam next year and will be allocating delegates who practice their arts off-Island (Diaspora). Diaspora will be representing all artists and practitioners living off-Island. 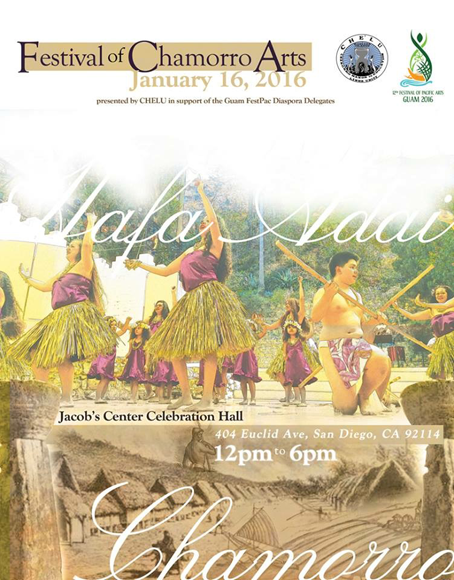 The CHE’LU organization of San Diego will host the first Festival of Chamorro Arts in San Diego on Saturday, January, 16, 2016.